Seatrade Cruise Global takes place in Miami, Florida in April every year. They connect over 11,000 professionals and more than 70 cruise lines around one message: feel at home like at home. The ports of Gdańsk and Gdynia advertised Poland with the slogan “Destination Poland”. 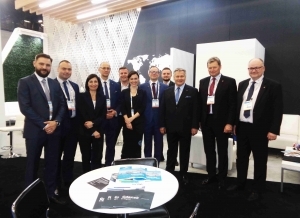 The Port of Gdynia, whose possibilities allow you to receive the largest tourist vessels sailing on the Baltic Sea, is a gateway to Pomerania and all of Poland – says Adam Meller, President of the Maritime Port of Gdynia. – This year more cruise liners will enter the Port of Gdansk than in previous years. The growing number of tourists reaching Poland by sea is not only money for ports, cities and the region, but above all a great promotion of Poland among foreign tourists. And that’s why we are in Miami – to advertise Poland as a tourist destination – explains Marcin Osowski, Vice President of the Port of Gdansk’s Maritime Administration. The Port of Gdynia hosted 50 large cruise ships in 2018, the average length of which reached almost 260 meters, and the number of passengers was over 100,000. However, each passenger “left” in the Pomeranian region an average of 80 euros, which in total gives a number of about 8 million euros. 60 passenger ships are planning to visit the port of Gdynia. In 2018, the Port of Gdańsk broke the cruise ship’s cruise record. Last year, 67 vessels visited the Gdańsk Port. 69 cruise ships will arrive in Gdańsk.